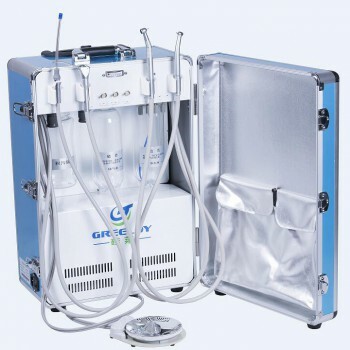 Buy Cheap GREELOY®GA-82 60L Dental Air Compressor Noiseless Oilless 310L/min form Alandental.com|Dental Equipment for Sale! 1. Super silent. Low working noise, create a quiet working environment. 2. Low vibration. With special rubberfeet, reduce vibration during operation. 3. Pure air flow. Oil free design, no lubrication oil needed during operation. 4. Core technology. Diamond hardness cylinder ensure durable working performance. 5. Fashion and durable design. Compact structure, light weight. Under normal situation, can be used for more than 20000hours. the motor would cut off automatically to ensure equipment and personal safety. 7. Easy operation. 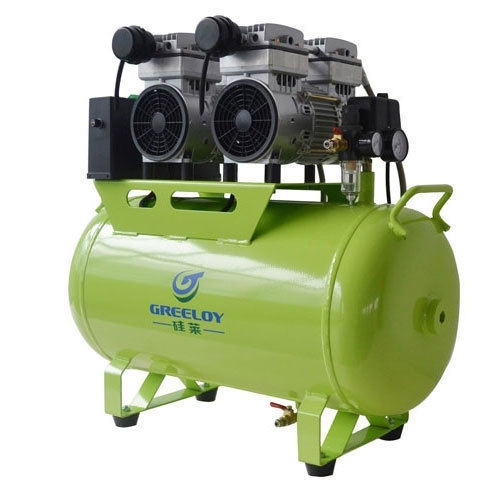 Quite simple operation, connect to power supply, then no need any more maintenance, just drainage regularly. 8. Low energy consumption. Full automatic design, automatic stop and restart control, low consumption. 9. High precision filtration. With double filters, ensure high precision of outlet air flow. 10. Tank inside has done anti-rust treatment. Ensure pure outlet air flow for medical equipments.